First the garage door has been humming along. Humming that is when the open button is pressed, but not opening. The to get it open you had to climb up and hold down the load limit button on the garage door unit itself and then it would grudgingly open, work for about 24 hours and then refuse to open until the reset was hit yet again. This would not do, and I was ordered to get it fixed. Some research indicated the humming but no power to start the motor meant that it was most likely a bad capacitor. So I ordered a replacement and it arrived in time for the weekend garage door opener project. 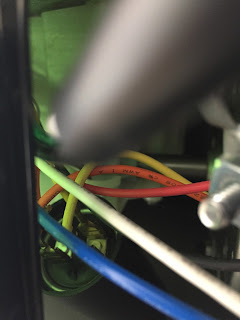 After unplugging the unit I took off the side panel and had remarkably little room to access the existing capacitor - it was in there tight and the band holding it in place had a screw that was angled away from the side door, making loosing the band rather difficult as a screw driver would not fit. Then the capacitor wouldn't move far enough away from the band as there was a plastic piece blocking its rearward travels and there was nowhere to go towards the front of the unit. It was a rather tight fit. Of course the wires were short and it was hard to see what I was doing in there and to remove them form the bad capacitor, but I managed to get the wires off and then back on in the proper places on the new capacitor, get it snugged back in, tightened up, and the garage door now functions wonderfully with no hesitation. No leftover screws form that job, but vocabulary was enhanced quite a bit. Thence to the side of the house, where a few very large and heavy tree limbs had fallen from a black walnut tree, blocking the path on the side of the house. At least they missed the air conditioner when they landed. 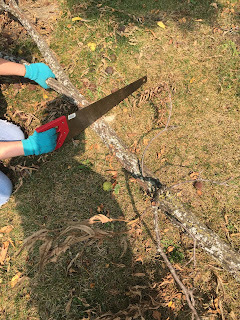 A nice manual saw was used to cut through the limbs, and black walnut is rather hard to cut through, and then we carried them off. 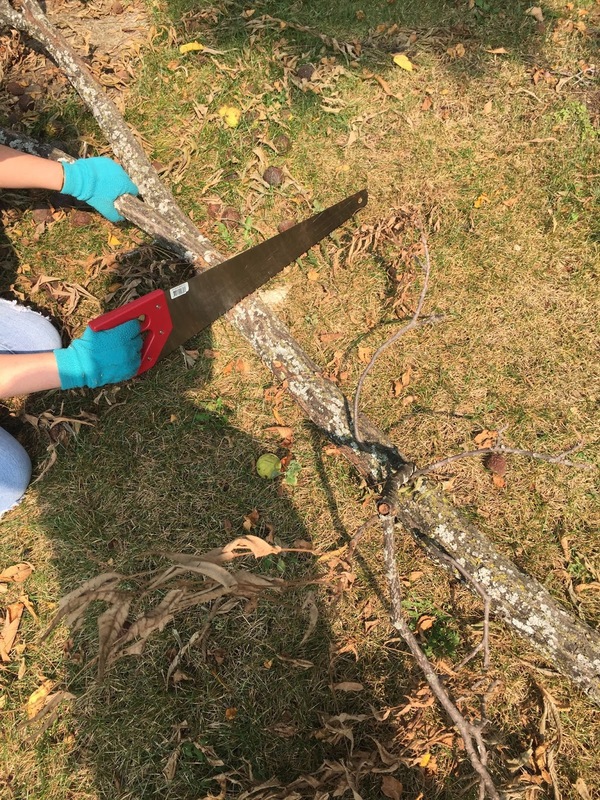 Leah enjoyed using the saw a little too much, declaring sawing through stuff was very satisfying. The limbs started out taller than she was but over time they were cut down to size. Ah, the joys of home maintenance. Old NFO: I was very happy that it took only a $25 part and lots of vocabulary to fix.